Concept art of the Area 51 base from The Art & Making of Independence Day. All images™ and © 2016 Twentieth Century Fox Film Corporation. All rights reserved. Round two of our war against alien invaders begins when Independence Day: Resurgence premieres on the weekend of July 4. But The Art & Making of Independence Day Resurgence July 4 weekend has a sneal peak at humanity’s arsenal and the aliens we’re battling, we’re happy to exclusively debut them. 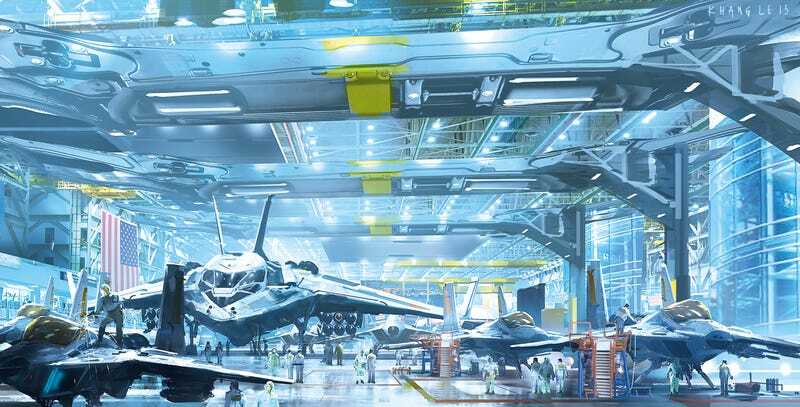 This concept art reveals the film’s massive scope, varied locations, and advanced tech. It also shows how the human used the war of 1996 to rebuild and get ready for the aliens’ return. With high-grade technology and power in sheer numbers, the ESD prepares itself against the possibility of alien invasion. For more on The Art & Making of Independence Day: Resurgence visit this link. It’s out today.